Trying to describe a Redman workshop is almost impossible as each one is a unique experience colored by the theme and people attending. A brilliant teacher and facilitator, Helen introduces the topic of each session by using material and imagery from a variety of sources including her own art. Each participant is encouraged to choose something that beckons from the wide array of materials available in the studio. 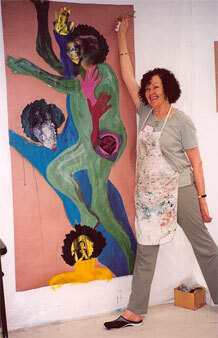 Once the creative process is sparked, each person begins their own journey into expressive art making. 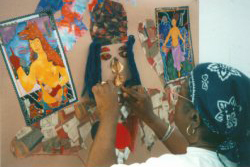 The atmosphere is playful and supportive as participants paint, draw, write, and create assemblages and collages. The art-making is followed by a stimulating group dialogue. As women of various backgrounds and ages share perspectives, they help free themselves and each other from the stereotypes that confine them in all stages of the life cycle. This invaluable part of the studio experience also reveals to each of us the special beauty and self-authorship of aging creatively. 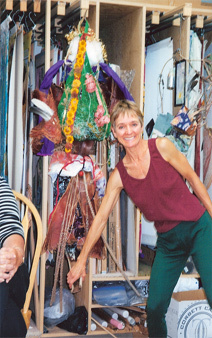 Groups or institutions may book half-day, day-long or weekend workshops at the artist's studio in San Diego or in their own settings. 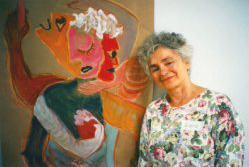 Redman travels to other cities to present workshops, slide lectures and exhibitions when an organization or sponsor provides funding and other arrangements. For further information, e-mail: redcrone@aol.com.